Seaventures house reef is one of the best dive sites in the area. 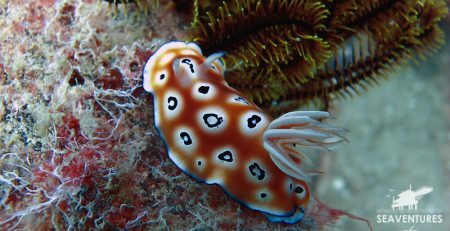 If you are a fan of nudibranch, or also known as sea slugs, our house reef is a place to dive at. 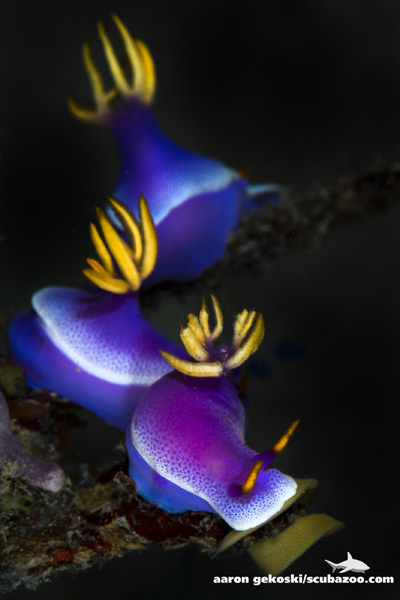 One of the sightings that you can see is the purple and yellow nudibranch – risbecia apolegma. Small in size, they are a sight to behold underwater. However, as beautiful as these creature are, they are toxic. The tentacles on their heads are highly sensitive, assisting them to smell, taste, and feel their way around. We can see the nudibranch all year round in our waters, unlike at some other places where they are seasonal. If you are into underwater photography, and you happen to see these purple and yellow little guys, tag us in your picture please! Who knows, your picture could end up on our corridors for all to see.